Damien Head Coach Mike LeDuc introduces NBA officials Justin Van Duyne, left, and J.T. Orr, who both make their homes in La Verne. LA VERNE, California, September 6, 2017 — You don’t become a coaching legend (702 wins at Glendora before continuing your legacy at Damien where for the 2016-17 season he was named the San Gabriel Valley Tribune Coach of the Year) by getting out-coached, outfoxed or outmaneuvered. You always keep a few tricks up your sleeve to maintain your winning edge. 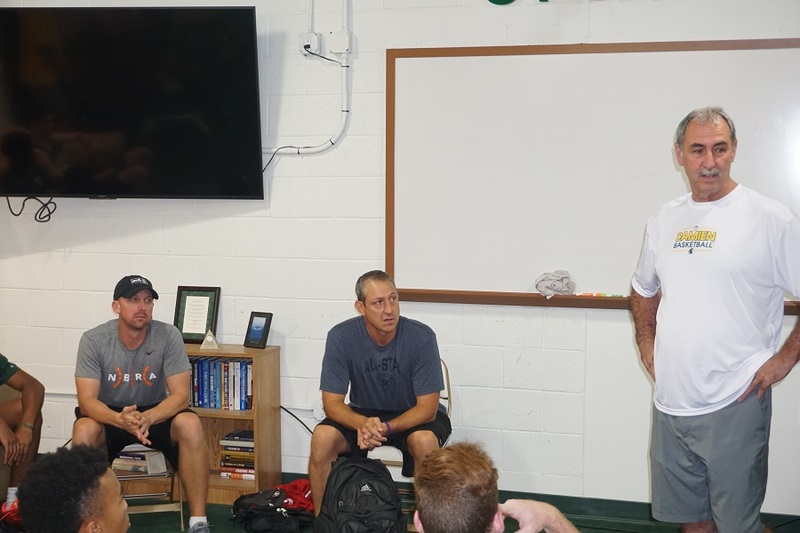 So there was Coach Mike LeDuc yesterday at Damien, inside the team room no less, inviting in hostiles, as it were, to address his players. Then without further adieu, he yielded the floor to J.T. 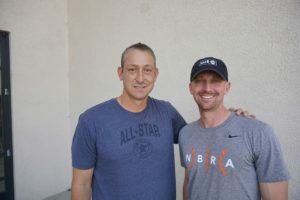 Orr and Justin Van Duyne, two National Basketball Association officials who both live in La Verne, making La Verne the only town in the United States to serve as the home of two NBA refs. “The odds are certainly astronomical that two of us would live in this tiny community of La Verne,” Orr said. That’s because there are only 64 NBA refs nationwide. It’s a fraternity rarer than the 100 men and women who make up the U.S. Senate (I mean how often do you see a U.S. Senator walking around). And LeDuc to his credit had two of them addressing his players two months before the high school basketball season even started. The guy’s brilliant. BUSTING A MOVE: J.T. 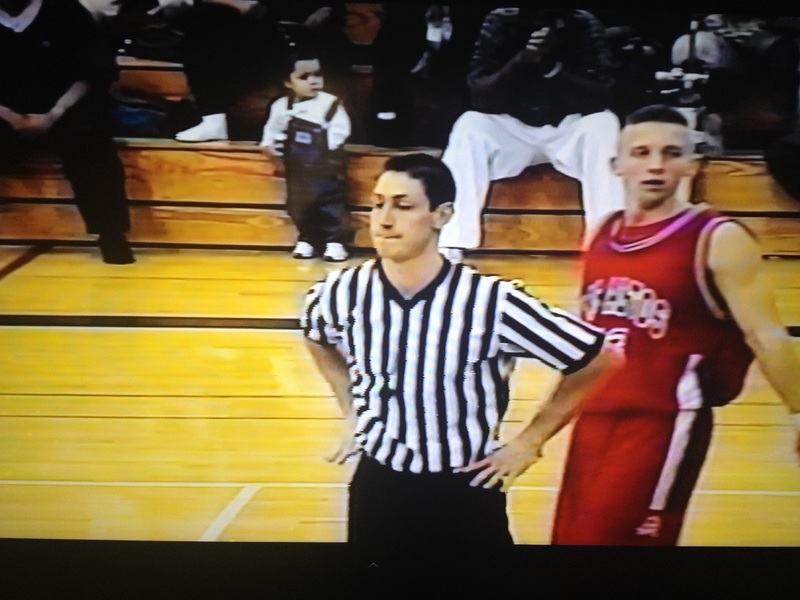 Orr refereed a high school game in which future NBA official and colleague Justin Van Duyne competed. But if his players thought they were going to catch a breather and have an easy day, they were sadly mistaken. Instead of running suicide wind sprints or undergoing some other pre-season conditioning torture, they were the recipients of an 11-question pop quiz that rivaled the SATs in terms of difficulties. There were few gimmes on the exam, and it appeared by all accounts that Orr and his NBA running mate, Van Duyne, took special delight in humbling Damien’s talented players with their brain-busting questions. But Orr and Van Duyne simply wanted to help the players in the room up their games. 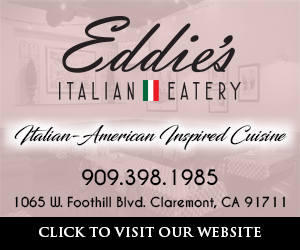 As former players themselves (Van Duyne excelled as an All CIF and All San Gabriel Valley selection from Los Altos High School), they too had thought they were young hotshots who had all the answers and knew all the rules. “The reason we’re going through this,” Orr said, beginning to read the questions aloud, “is we want you to think.” A thinking player who knows the rules can take advantage of game situations that an uninformed player cannot. If a few players were slouching in their seats at the beginning of the “clinic,” they all became model students moments after they saw Orr and Van Duyne begin to pass out NBA swag (shorts, jerseys, sweatshirts, backpacks, etc.) to players who could answer their questions correctly. “How many officials are there in the NBA?” Orr asked. Somebody answered “33.” The answer was barely in the ballpark (or arena), but it happened to be the best answer and earned a prize. In between their good-natured ribbing, both Orr and Van Duyne briefly shared their refereeing resumes. Both had risen through the ranks, advancing from high school games to the college ranks and eventually the NBA’s developmental league, now called the “G” league for Gatorade’s sponsorship announced this year. On the night Orr finally broke into the NBA refereeing ranks, a Memphis-Cleveland contest, LeBron James scored 43 points to lead his team to an 111-109 overtime win. “For that to be my first regular season game, in a sold-out arena, with 17,000 or 18,000 screaming fans, it was just phenomenal,” Orr recalled. While both Orr and Van Duyne continued to climb the ladder, they never gave up their day jobs. Orr worked as a counselor at both McKinley’s Children Center and the LeRoy Haynes Center. Van Duyne after graduating from the University of La Verne taught school for two years before serving as an Ontario police officer for another nine years. Still they continued to chase their dreams. Along their journey, they continued reffing, attending coaching clinics, improving their games and learning new respect for the game. Orr, recognizing that everyone who was in the room was there because of their love of the game (“Why else would you put up with all that running and the coach yelling at you.”), urged players to stay connected to the game after their playing days were over, which would likely be high school for the majority of them. Van Duyne reffed freshman and JV games when he wasn’t playing games on the varsity at Los Altos. Then the talk the turned to the finer points of the game. LeDuc was particularly interested in learning what referees’ “trigger points” were, thinking that if his players could better understand what referees” hot buttons were, they could stay on the floor longer rather than picking up a silly foul or, worse, being ejected. “Respect and professionalism are always going to take you a long way,” Van Duyne said. 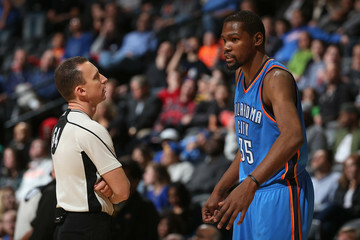 Wouldn’t you love to eavesdrop on this “conversation” between Kevin Durant and Justin Van Duyne. “Think about what you say and how you say it,” Van Duyne echoed. Unlike baseball, which is black and white, according to Orr, where the ball is either a ball or a strike or fair or foul and a player is either safe or out, the NBA deals in more shades of gray or judgment calls, despite having a rule book that is very specific. Hearing that, Damien players in the room wanted to know if their protests or complaints could influence a ref to reverse a call. “In all my years refereeing, and it’s been almost 20 years now, I have never changed a call. It’s not going to happen,” Van Duyne said. He was talking about foul calls,not an out-of-bounds call where two officials might disagree initially before conferring or reviewing video to get the call right. Then the pair put to rest popular misconceptions that home teams get more favorable calls than the road teams or that star players receive preferential treatment over journeyman players or rookies. Another misconception they tried to dispel is that all players travel (take an extra step) in the NBA. “Traveling rules in the NBA are written differently,” Orr explained. “It’s not that we don’t call traveling. We call it according to the rules.” In the NBA, players are allowed a “gather” or “zero,” step, which Orr then demonstrated for the Damien players. Orr and Van Duyne will be among the first to tell you they don’t get all their calls right. But they are students of the game, constantly critiquing their games to improve. “Joey (Crawford) said, ‘Bad officials are bad because they don’t know their bad and good officials are good because they know when they’re bad,'” Orr noted. If Orr and Van Duyne have an inside edge it’s that they both live in the same town, so they regularly get together to study the rules and work out so during the regular season they can keep paces with the best athletes in the game. Van Duyne has also hired a personal trainer. Officials run up and down the court between four and five miles during NBA games. They also ref summer league games and attend refereeing clinics to stay sharp. Both Orr and Van Duyne prefer anonymity to popularity but with all of electronic and social media devices with everyone’s reach, they know it’s tough to stay under the radar. They both have families — Orr and his wife Tanya and their daughters Shea and Serenity, and Van Duyne with his daughters Madison and Brooke and son Jared — and are regularly out in public. Coach LeDuc certainly knows who they are and, more important, where to find them, and his team his clearly the better and wiser for it. And now for that test Orr and Van Duyne put the players through. Let’s see how you measure up. The Answer Key follows the questions. If you find yourself struggling, don’t be too hard on yourself. The tops scores were seven out of 11, or 63%, about Shaq’s free-throw average and we’re being generous. Good luck! How many minutes are there in a high school game? After picking up your dribble and establishing your left foot as your pivot, can you lift your left foot without being called for a violation? True or false: During a jump ball, the jumper can never be the first player to possess the ball? During warm-ups, a player stuffs the ball through the rim, but doesn’t touch the rim in any way. Is there a penalty? What’s the maximum number of players each team can have on the free throw lane lines? What’s the size of the ball? 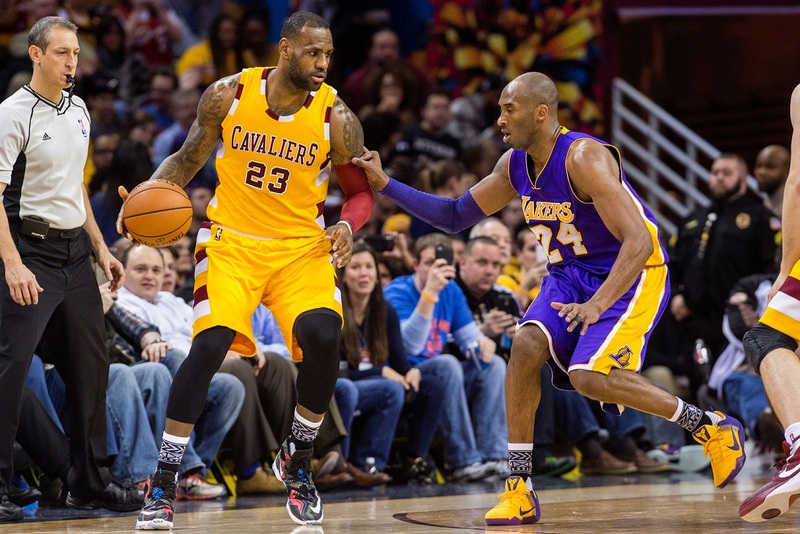 Can you ever jump from your frontcourt, catch the ball and land in your backcourt? During a throw-in, the player with the ball steps with his right, then steps with his left without releasing the ball. Is this a violation? Offensive player A1 shoots a hook shot in the lane? The ball doesn’t touch anything (air ball) and player A1 catches the ball and begins dribbling again. Is this a violation? Offensive player A1 takes a jump shots with 7 seconds on the shot clock. The ball doesn’t hit anything (air ball) and is caught simultaneously by A2 and B2 with 5 seconds remaining on the shot clock. Team A has the arrow and is awarded the ball out of bounds. How many seconds will be on the shot clock for the inbound. Following a held ball, team A is inbounding since they had the possession arrow. Before the ball is released on the throw-in by A1, an illegal screen is called on A5. Which team will receive the next alternating possession throw in? Bonus question: How many rules are in a high school basketball rule book? Splash Page photo courtesy of the NBA. Coverage provided by Hillcrest, A Remarkable Retirement Community in La Verne. For information about this remarkable place, please call 909.392.4375 or visit LivingAtHillcrest.org.